Puck Daddy is pretty much the gold standard for hockey blogging. Just about every guy or girl who starts up a hockey-centric blog is hoping to turn into Wyshynski one day. This summer, Puck Daddy rolled out a new series call Essentials. This is a post that revolves around the Essential player, goal, season, game etc. about each team in the league. While the Sabres version has yet to come out, I wanted to have a little fun with this idea. So, rather than step on the toes of Puck Daddy, Wysh and whichever Sabres blog is awarded the Sabres Essentials, I chose to go a different direction. This will be the Unessentials for the sabres franchise. For the most part this will just be the opposite of what the Puck Daddy series has highlighted. For example, the unsung hero may be an overrated player, the best game will be the exact opposite of that. Hopefully you get the point. Kozlov was what the Sabres got in return for Dominik Hasek. The Sabres also ended up with a draft pick that was eventually ended up with Atlanta for the 2002 Draft. Kozlov’s tenure in Buffalo was short and uneventful. He played 38 games and scored nine goals before a laceration put him on the shelf for most of the year. Kozlov hasn’t been shy about complaining about the city and his time here. He is also probably a big reason why many Sabres fans think that all Russians are lazy jackasses. Six months prior to the start of the 02-03 season, John Rigas and his sons were shipped off to jail, the Sabres lost their owners and started on a spiral to the bottom of the league. At that point, “Hockey Heaven”was only drawing about 10,000 fans per game, the team couldn’t win and there were whispers that the Sabres could potentially leave town. The 02-03 season led to the draft pick that became Thomas Vanek, the Golisano ownership, Daniel Briere’s arrival and the moves that would build the foundation for the 2005-06 team. However, the time after Hasek left in the early 2000s were dark days for the Sabres franchise. This could probably be quantified as the Unessential period for the Sabres as opposed to a game. After Jochen Hecht scored a textbook behind-the-goal line tally late in the second period, the Sabres looked destined for the Cup Finals. Then Rory Fitzpatrick happened. The Canes rolled back in the third period, victimizing the Sabres patchwork, AHL defense and went on to win the Cup in seven games. If only Jay McKee hadn’t come down with that staph infection. Need I say more? You can certainly debate if he had full possession of the puck the entire time his foot was planted in the paint, but that goal will forever live on in Buffalo. I still practice Ken Hitchcock’s team celebration tactic anytime I have won something that might be debatable. This trade signified a changing of the guard for the Sabres, who gave up one of their best offensive weapons in exchange for stability in the crease. However, Fuhr never amounted to be dominating in blue and gold and would be supplanted by Dominik Hasek after a few seasons. While Fuhr eventually was packaged to acquire Alexi Zhitnik, this trade was severely lopsided against the Sabres. After wrestling with a few different players (Mike Wilson, Jochen Hecht etc. ), I settled on Connolly and Pyatt. They were the return for Mike Peca from the Islanders and the results were mixed. Taylor Pyatt wouldn’t hit water if you threw him off a boat and was in and out of the lineup in Buffalo. He has since moved onto Vancouver and Phoenix. Connolly enjoyed some more success here but never became the game breaking talent many expected. His concussion history kept him off the ice more than on it and his salary was massively inflated compared to what he brought to the table. Considering these were the pieces sent back for Mike Peca makes it that much worse. Since this can’t be all doom and gloom, the Unessential villain for the Sabres would need to be someone the team absolutely victimizes. I couldn’t think of anyone better than Brent Johnson, who doesn’t seem capable of stopping pucks at First Niagara Center. Fritz is an absolute monster and fared quite well against Peters in their bout in 2008. It is hard to remember many really bad fights, so this is the one that takes the cake for me. You might not realize that Buffalo is the only place that Scotty Bowman didn’t advance to the Cup Finals. St. Louis and Buffalo share the distinction as the only cities that Bowman didn’t deliver a Cup to, but Buffalo is the only team he didn’t guide to a Cup Final. The Sabres broadcast history is pretty much Rick Jeanneret and Ted Darling. Kevin Sylvester has filled in at times and John Gurtler was the man for a number of years as well. Basically, this was a difficult category to fill in because there isn’t much to evaluate outside of Buffalo’s two legends. Gurtler is easily overshadowed as the filling between the two cookies that are RJ and Darling; and Sylvester may be the one who has the unfortunate task of filling RJ’s seat upon his retirement. Both are in a no-win scenario in terms of comparison. So, this is not an indication of their skills as on-air personalities but an indication of how difficult it is to replace two legends. This is both an essential and unessential for the Sabres. Gamedays down at FNC have deteriorated into a very docile atmosphere for home games. Fans get very excited when the Sabres score, but for little else. Some blame the fans, some blame the team and some blame the game presentation. Blame who you want, but the biggest arena trend must be this. Personally, I think the food at FNC is pretty decent and isn’t a complete ripoff. The beer is even fairly priced for a sporting event. I am no stadium expert, but I think Delaware North is doing a fine job with the food at FNC. A return to blue and gold excited so many Sabres fans prior to 2006. 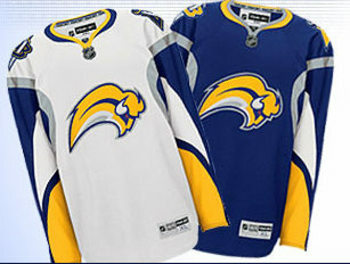 However, the logo the Sabres went with was not as widely accepted as the new colors. The slug logo was mocked by fans, media and rivals all over and never gained any respect. In fact, the team hosted a Slug Appreciation Day so that fans could buy updated apparel at a discount. The Slug could have been a great way to introduce a new, dynamic logo to the organization. It just didn’t work out as planned. Fact: Brent Johnson’s GAA against the Buffalo Sabres was once above 8.